Covered races include: U.S. Senate, U.S. Congress, Governor, Lt. Governor, State Senate (even-numbered districts) and State House. Personalized: Identify just the candidates that will appear on your ballot – including your new Congressional district. Factual: All answers are based on each candidate’s response or on publicly available information. Non-partisan: Each candidate is treated equally and presents information to help you make an informed decision. Church-friendly: Legal for any church to share with its members to help educate and encourage voting in the Primary Election on May 15th. Free: Concerned Pennsylvanians dedicated to responsible citizenship have donated to Pennsylvania Family Council to make this resource available, free of charge. For full access to our free guide, go to PaFamilyVoter.com. 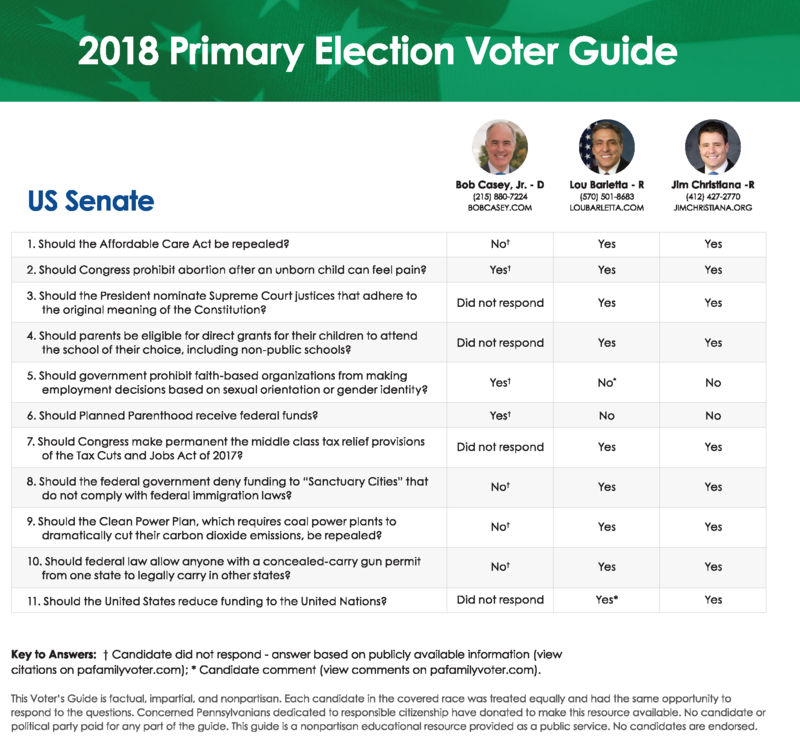 In addition to our PaFamilyVoter.com website, a printed postcard is available with the statewide races for U.S. Senate and Governor (as seen above). To order bulk copies, click here or call 717-545-0600. Every election season, Pennsylvania Family Council offers resources to help you be an informed voter on Election Day. These resources are available thanks to the support we receive from families across Pennsylvania. To contribute to Pennsylvania Family Council in support of these resources, you may make a secure online donation or contact our office at 717-545-0600. 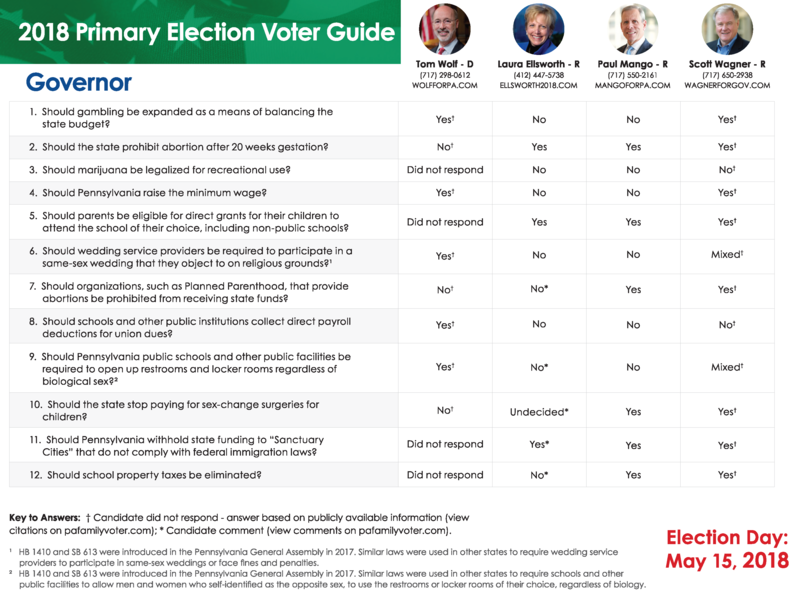 I am so thankful for your PA Family Voter Guide. There has been such confusion over candidates Scott Wagner and Paul Mango for Governor. Seeing the answers to their questions has totally cleared this up for me. It confirms the research I have done. I just ordered 150 Bi-Partisan Voter Guides for my church as my pastor has given his approval. I want to read some of the candidate’s comments on their answers. Where can I find those? Hi Nancy – for any comments by a candidate, please go into http://www.PaFamilyVoter.com and access the online guide. I also can’t find those comments, even following your instructions above and checking the site index. My apologies. When I tried again, a different screen came up and I DID find those candidate comments. Wonderful concrete information on the candidates for those of us who don’t have time to research information themselves. Thank you! Thanks so much for all your research and work to inform us. I rely heavily on your reporting.